Pest description and damage Grasshoppers or short-horned grasshoppers are related to crickets and katydids. They feed on plants with their chewing mouthparts. They are most abundant in hot dry climates east of the Cascade Range but do occur on the west side as well. The immature grasshoppers look like small adults but without wings. Later instars have rudimentary wing buds that become fully functioning wings in the final molt to adult. The forewings are leathery and meet in a straight line down the back. They are used in a gliding flight. The membranous hindwings are for gliding and flying. The hind wings may be clear or have red, yellow or black bands. Body markings and colors may be brown or green, or have ornate patterns of bright colors that vary with the species. Many species make a clicking sound with their wings as they fly. 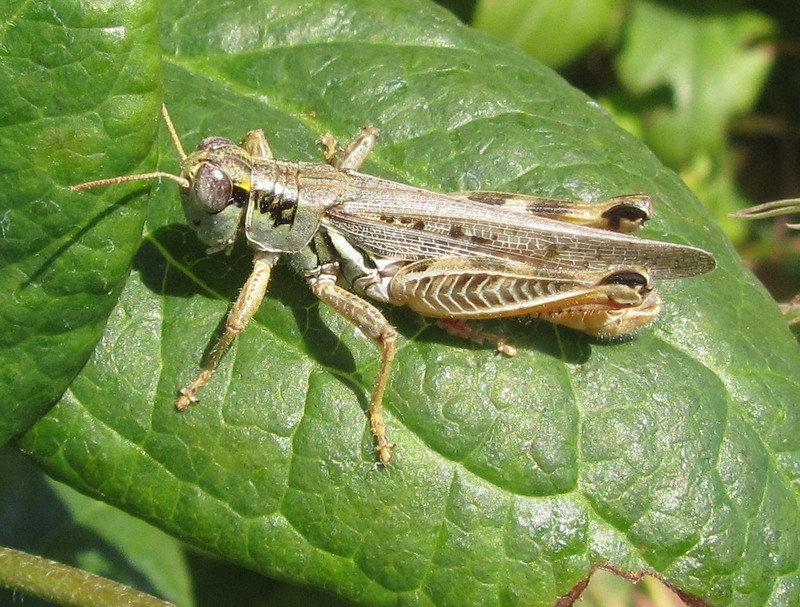 In some areas, especially east of the Cascades, grasshopper numbers can increase to epidemic proportions and when preferred foods are exhausted, grasshoppers move to landscapes to feed. Some species can change to a migratory phase and fly long distances to new feeding areas. Biology and life history Grasshopper life cycles vary with the species involved. Eggs are deposited when the female pushes her ovipositor into the sand or soil in the autumn. The eggs overwinter in the soil and begin hatching in the spring. There is one generation per year. Spring temperature, excessive moisture, natural enemies and other factors naturally reduce grasshopper numbers. Pest monitoring Scouting for grasshoppers is based on the number of grasshoppers present in the previous fall, the number that successfully hatch, weather, temperature and presence of natural enemies. In dryland areas, assessments are conducted by range managers and government agencies responsible for specific jurisdictions (i.e. BLM, State Departments of Agriculture, USDA-APHIS and PPQ). Landscape professionals in areas of traditionally high grasshopper infestations should consult with these agencies or land grant university Extension offices in the area for forecasts on grasshopper populations. Often the sources of grasshopper infestation occur in ditches, surrounding grasslands, pastures and rangeland where soil cultivation prior to grasshopper egg hatch can greatly reduce population outbreaks, but if the commercial producer or homeowner does not own these adjacent areas, this control strategy is not possible. Physical barriers (netting, floating row covers and other crop protective covers) can provide some protection from grasshoppers. In home landscapes, adults can be netted or squashed when encountered. Placing trap crops in the home landscape can serve as a barrier to trap and intercept localized grasshopper infestations. Natural biological controls of grasshoppers include sage grouse and other wild birds, insectivorous mammals, and protozoans such as Nosema locustae. The larvae of blister beetles prey on grasshopper eggs. Some studies have shown that guinea hens, geese, duck, and turkeys have reduced grasshopper populations in home landscapes, but they can also can damage desirable plants.